Ben began studying violin at the age of 8 in Santa Rosa, CA, and began private instruction with Dominic Dissaro at age 11. He soon arrived at the University of California Santa Cruz (UCSC), where he learned advanced classical technique and repertoire from violin virtuoso Roy Malan. While at UCSC he also studied jazz improvisation with jazz greats Ray Brown (trumpet) and Smith Dobson (piano). He completed a BA in violin performance, and continued on for an MA in 20th Century performance practice, with an emphasis in computer music. Ultimately, he found the classical music world to be unfulfilling, and not particularly lucrative. First and foremost Ben’s love of music stems from a feeling of being the music, that he can best achieve through improvisation. 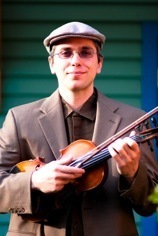 He has spent most of his musical energy during recent years intensely studying jazz violin and other fiddle styles. In 2003 Ben played extensively with the Hot Club of San Francisco (filling in for Evan Price). Since that time, Ben has played with various bands including, Frizz, Hot Club Pacific, Route5, Water Bear, the Djangophiles, Clambake, Graxxus, Xavier and the Classic Band, Blue Lightning, Vagabond Opera, and the 12th Ave Hot Club. He is in demand as a studio musician, and gigs regularly.